In the 1930s, Lynemouth became famous as the home of the O’Keefe brothers: six guys from the same coalmining family who all became accomplished boxers. 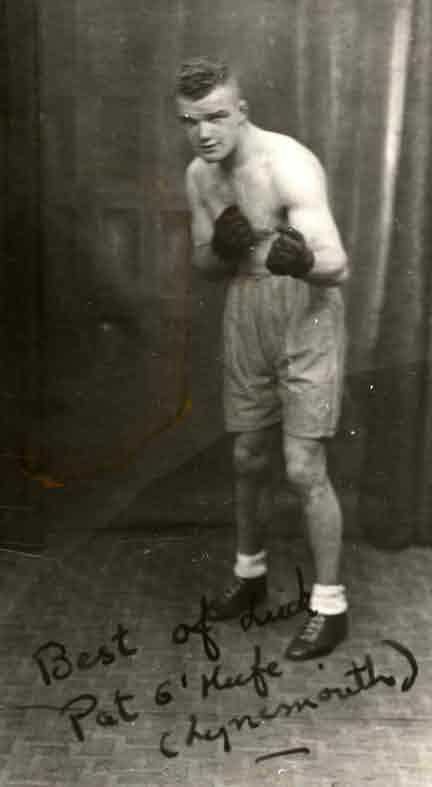 Tommy was a pitmen’s lightweight champion – before going off to war with the Duke of Wellington Regiment in North Africa, Sicily and Italy; Pat (pictured above) was a respected middleweight who began fighting at 14; and Ralph Henry – better known as ‘Sexton’ – was a professional flyweight by the time he was 15. 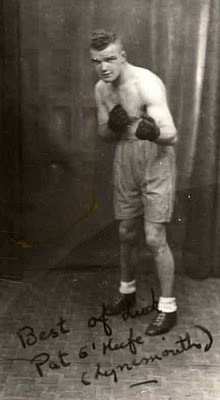 Competing at a slightly lower, amateur level were Mattie, a welterweight who excelled in the ring during his navy years, winning several trophies; John, who similarly won titles in the forces (for the West Yorkshire Regiment) in the featherweight division; and Eddie, who seemed particularly proficient at dishing out knockouts – a couple of dozen in a row at one point – as a middleweight. The brothers once challenged the world to find them another six brothers to fight. Needless to say, the appeal fell on deaf ears. Ellington Colliery in Northumberland holds the distinction of being the last of the North-East’s deep coal pits to close, so ending the 800-year+ history of the industry in the region. When the ‘Big E’ finally shut up shop on 26th January 2005, it was also the last remaining British deep mine to extract coal from under the sea – a practice in which it solely specialised. Ellington didn’t actually gain its colliery until 1909, when the Ashington Coal Company began operations there – with production starting in 1911. It slowly grew and grew, combining with nearby Lynemouth Colliery and reaching over 1,300 employees by the time of nationalisation in 1947. Despite the mechanisation of the post-war period, the workforce had swelled to well in excess of 2,000 by the otherwise troubled times of the mid 1980s. It was a big pit, producing 45,000 tonnes of coal per week at one point, but began overstretching itself under the North Sea as time wore on – miners having to travel an astonishing 16km to reach the coalface. Flooding was always a problem, with as much as one million gallons being pumped out of the pit daily, and it was reported that at one time three tons of water were being raised for every ton of coal wound. Flooding effectively led to the closure of the pit when, in early 2005, water catastrophically burst from a new coal face that had promised to provide another five year’s work. Its operators had little choice but to close the colliery in its entirety and the last 340 jobs were lost, along with the Great North Coalfield itself. A few years before its closure, the pit found international fame via its appearance in the 2000 film Billy Elliot, where it doubled for the long-gone Easington Colliery. And in 2009, 100 years after the pit was sunk, a bronze memorial was raised on the deserted site, in honour of both the 83 men who lost their lives there and the industry in general across the region. I know you’re curious, so let’s start with the pronunciation. Is it, literally, ‘Ulg-ham’? Or maybe ‘Ulf-ham’? Or is it a silent ‘g’, perhaps? Well, you’re getting closer. It is, in fact, a silent ‘l’, giving us ‘Uffam’, as I’m sure all you locals know! Place-names and their pronunciations never cease to fascinate, do they? And in case you’re still a little puzzled, the literal meaning of ‘Ulgham’ is ‘the hollow frequented by owls’. Records show that one of the earliest references to the sport of football (i.e. seeming to indicate that the ball is kicked rather than carried or otherwise propelled), dates to 1280 and the village of Ulgham, Northumberland. The source (the Calendar of Inquisitions Post Mortem, Vol.1, p.599) reportedly states that Henry, son of William of Ellington, was killed while playing at ball with a large number of friends. In the course of play, he ran fatally against David le Kell’s (or le Keu’s) dagger, which pierced his belly. In my hunt for further information, I have been unable to trace the story back through any of my books (or the Internet). I’d love to learn of the finer detail. Can anyone help? Not that it enjoyed much as regards a ‘heyday’, you understand. For despite its apparent grandeur, its history is brief, unremarkable and somewhat cursed. Earliest records indicate that Gerard Widdrington was granted a licence to crenellate in 1341, and the pile was still in use by the same family in 1415. King James VI of Scotland stayed at the house on his way south to claim the throne of England in 1603, providing the pile with perhaps its greatest claim to fame. It seems the house was greatly rebuilt and/or added to shortly after this, attaining its above form. 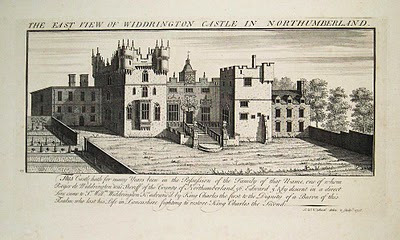 The Widdringtons ceased using the castle as their main residence in the 1640s, then subsequently disgraced themselves for their part in the Jacobite Rebellion of 1715 – the castle being confiscated by the Crown and sold to Sir George Revel. In 1720 it was described as ruinous. By marriage, it then passed into the hands of Sir George Warren in 1761, who demolished what was left of the place. Warren attempted a rebuild, but the new erection was destroyed by fire prior to completion. Undaunted, he tried again sometime after 1778, but this new Gothic-style effort fell into disuse as early as 1802. In 1832, it was described as “now obliterated” by historian Hodgson, a state assisted towards the end of the nineteenth century by the requisitioning of the remaining stone for the construction of a new vicarage. © Copyright JohnDal and licensed for reuse under this Creative Commons Licence. There are the remains of a chapel and house – the latter being the younger of the two, dating to the early 1500s. The site was given to the Knights in order that they may raise revenue to help fund their sorties to the Holy Land during the Crusades. 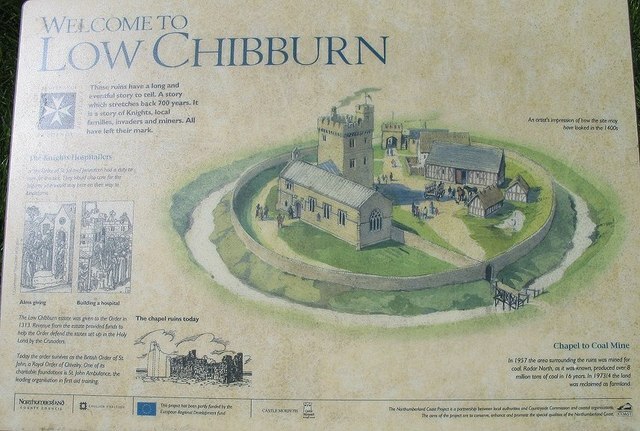 Low Chibburn would have effectively acted as a small farm, with a chapel for worship and an accommodation block. The plot was originally surrounded by a moat, but this has faded from view thanks to land movement due to coalmining in the 1950s. In the year 1799, there was a hedge-hog in the possession of Mr Sample, of the Angel Inn at Felton, in Northumberland, which performed the duty of a turnspit, as well, in all respects, as the dog called the turnspit. It ran about the house with the same familiarity as any other domestic quadruped, and displayed an obedience, till then unknown in this species of animal. Search as I might, that is all I could find about the peculiar little animal. But whatever is a ‘turnspit dog’, I wondered? Is it what it seems to be from its title? Well, as it happens, yes, it is. 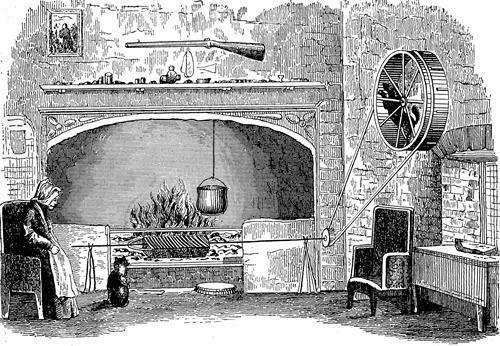 Turnspit dogs were in reasonably wide use until the middle of the nineteenth century as a labour-saving device in large households for the turning of meat on a spit. The dog would be placed in a small wheel connected to the spit and as he ran the spit would turn. Dogs were often kept in pairs to spread the workload – the saying ‘every dog has his day’ possibly coming from this practice. The breed appears to have died out as kitchens became more mechanised. These curious beasts had, obviously, very short legs and long-ish bodies – and apparently doubled as foot-warmers in church on Sundays! But I read this last bit on Wikipedia, so don’t take it as gospel. A turnspit dog in action. Quite what our industrious pooch thought of his feline friend’s way of life we can only imagine. Though it is still marked on the map, the village of Radcliffe effectively no longer exists. It once lay a little to the east of the current A1068 a mile south of Amble, populated by some 700 folk, all of them pretty much tied to the local colliery of the same name. It was your typical mining community until around 1892, when the discovery of a fault in the seam, followed by fire and flood, made the extraction of coal uneconomical. The engineers tried sinking shafts at nearby Newburgh and Hauxley, but these, too, proved to be problematic. They struggled on at Radcliffe as best they could, until the towel was finally thrown in in 1962. In 1965, plans were drawn up for the much more economical form of coal extraction from the area, namely, opencast mining. To effect this, it was necessary to clear the aging housing and pit-head buildings of Radcliffe, and this was completed by 1971. 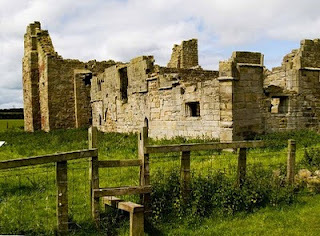 Those that had not already moved were relocated to Amble – and onto an estate named the Radcliffe Estate, a complex which itself contains many streets named after those of the old village. Opencast operations have themselves now passed into history, and the area generally given over to agriculture. 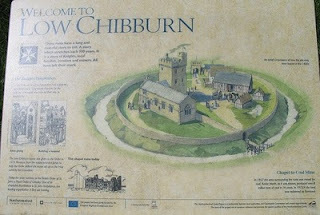 A few buildings survived the demolition of c.1970 – a garage, a farm and a few private dwellings along the A1068, but nothing of the main village in the fields to the east. The Radcliffe War Memorial, erected in 1928 and added to after WWII, was relocated to Amble Town Square during the village’s dismantlement. John Rushworth, that is. Who? I hear you ask. Well, the third President of the United States and principal author of the Declaration of Independence, Thomas Jefferson, was something of a fan of this now largely forgotten native of Acklington Park, a settlement a few miles to the south-west of Warkworth in Northumberland. Rushworth was born in 1612 to a very well-to-do family with Yorkshire roots. The somewhat remote site of his birth did nothing to hinder his progress in life, however, progressing to Oxford University, from where he graduated in 1640. He became a student barrister, and thence clerk-assistant to the House of Commons, having made the acquaintance of King Charles I – and even married the sister of the future Speaker of the House. When all hell broke loose a year or so later, Rushworth became a supporter of Oliver Cromwell, with whom he had much in common, both politically and religiously. When the English Civil War commenced, he became Secretary to General Fairfax as well as Secretary to the Council of War. 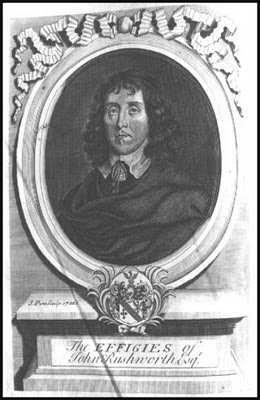 John Rushworth effectively became the first ever official chronicler of a major war, being present at many of the big battles which ensued during 1642-51. He was also involved with negotiations with the king, as well as events surrounding his trial and execution (though he was not a signatory to the death warrant). Oliver Cromwell appointed Rushworth his personal Secretary during his ‘reign’, and was given much in the way of new responsibilities and roles thenceforth, much of them related to law reform. John Milton, John Bunyan and Samuel Pepys were all close friends of his, and he became MP for Berwick on several occasions over the ensuing decades. In 1659, a year after Cromwell’s death, he published his famous Historical Collections (aka The Rushworth Papers), effectively a chronicle of the Civil War years (if a somewhat biased one), in which he espoused his methods and his reasoning. As Richard Cromwell’s power ebbed away during 1659-60, Rushworth, as Secretary to the Council of State, became, briefly, a very influential figure. Despite the Restoration of the Monarchy in 1660, Rushworth managed to maintain positions of power, and was even made a Knight of the Order of the Bath in 1661. But it wasn’t to last. King Charles II never could quite forgive and forget, and Rushworth was eventually tried and imprisoned in the King's Bench Prison in 1684. He died in 1690, isolated from his family (he married and had four daughters) in a damp room in Rule's Court, Southwark, depressed, under-nourished, and suffering from senile dementia, aged 78: “where, being reduced to his second childship, for his memory was quite decayed by taking too much brandy to keep up his spirits, he quietly gave up the ghost in his lodging in a certain alley there, called Rule’s Court, on 12 May 1690”. When, in 1890, King’s Bench Prison was demolished, ‘Rushworth School’ was built on the site and the thoroughfare was renamed ‘Rushworth Street’. His writings, however, found greatest favour in the US where they served as a source of inspiration for Thomas Jefferson. Rushworth's Historical Collections occupied pride of place in the great man’s library and he often quoted from them. Rushworth’s views of Charles I as a monarch who had “declared war on his own people” were later echoed in words by Thomas Jefferson and others when writing about the reign of George III and his actions during the War of Independence. 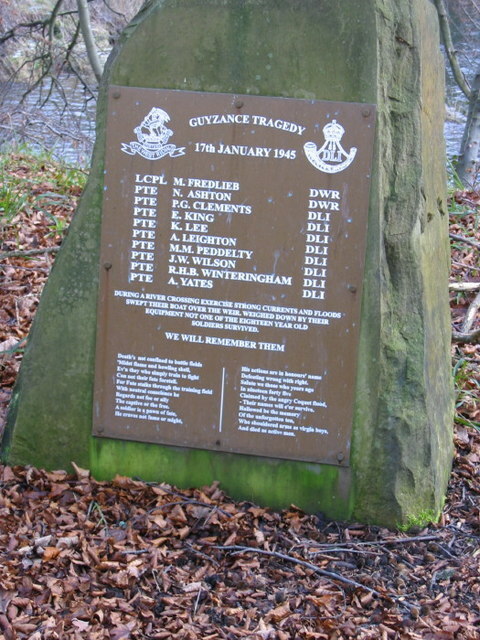 On 17th January 1945, a group of ten teenage squaddies convened on the banks of the River Coquet a mile or so upstream from the small village of Guyzance in Northumberland. The spot was once the site of the old Acklington Ironworks, and the eighteenth century dam constructed to power the plant is today considered to be one of the finest examples of its kind in England. It will now, however, forever be remembered as the scene of the Guyzance Tragedy. The soldiers were serving in the 10th Battalion, The Duke of Wellington’s (West Riding Regiment) / Durham Light Infantry, and had been charged with the task of practising a river crossing. The river was in full flood, and locals warned the men against the action. The decision was taken to proceed, however, and the 18-year-olds entered the water one mile upstream from the weir/dam, quickly lost control of their craft and were swept down the Coquet and over the weir. Weighed down by their kit and the force of the water, all ten were tragically drowned. 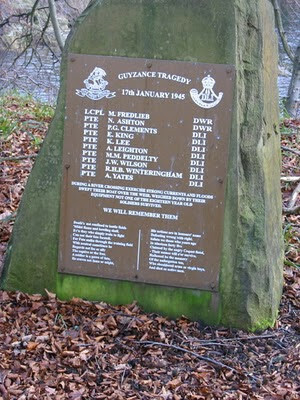 The spot is marked with a modern-day copper plaque mounted on a block of sandstone, and by two older memorials mounted upon a post.